Editor Note: San Diego Free Press contributor Brett Warnke is in Philadelphia. He’ll be sending updates and interviews from the DNC. On Monday, storm clouds hung over Philadelphia as Democratic delegates arrived to Wells Fargo Center at AT&T Station south of downtown to a protesting crowd virulently against a Hillary nomination. Over 1,000 protestors, most with Bernie Sanders shirts or stickers, were in high dudgeon after revelations of tilted tables and bias within the DNC. Gone was the sense of hope and inspiration I’d seen at Bernie rallies in San Diego. What remained were conversations among clusters of Bernie die-hards about “tilted tables” and “election fraud.” The crowd was angry and Bernie signs shook with desperate vigor. But Monday had the feel of a stopped station wagon, a father behind the wheel, screaming at the glaring dead end sign. Of course, there were the smelly anti-choice foamers shouting down real conversations over their loudspeakers. Above us all were tall fences bordering FDR Park that separated the lanyard-sporting delegates who spilled from their trains from the loud wall of protestors. “We’re going to lose in November,” Lisa Heinenan told me, wearing a “Hillary for Prison” shirt. Heinenan travelled from Grand Island, Nebraska with her daughter to protest Hillary Clinton’s nomination. 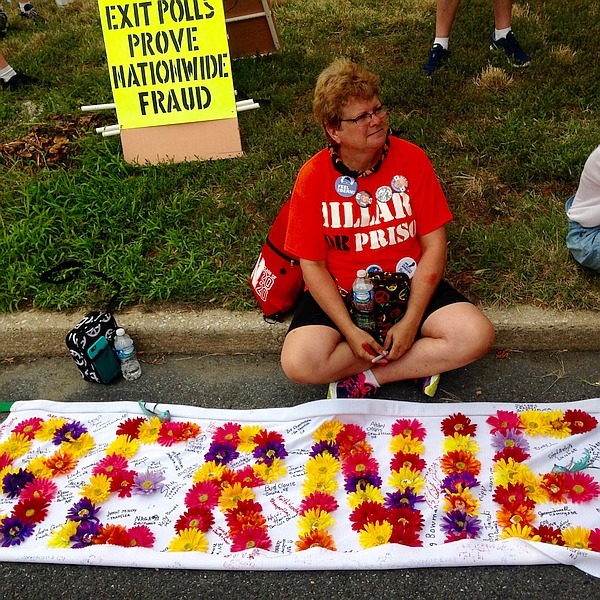 Her splayed flowered banner read “BERNIE” with dozens of signatures from across the country. She sang Bernie’s praises until I asked about the tone of the protests, their purpose and goals. “We’re 99% defeated,” she said. “But this, this is a last ditch effort…” she said, nodding as if I would understand. I didn’t. I looked around at the “Hill No!” signs and the “Bernie or Jill, Never Hill” signs, a bit bemused. “Sanders didn’t release his delegates,” Heinenan said. “He hasn’t conceded,” she said. Such statements made me wonder whether the Bernie die-hards were saying that their candidate was supporting a criminal? Was he complicit in her crimes by failing to be on the barricades demanding, as Alex Jones had just days ago, to “lock her up”? What did it say about the “wise” sage from Vermont, a man so many told me they respected as pure and honest, if he now supported a criminal? There were groups of Dreamers, a “Food Not Bombs” march, as well as bands, parades, and a thirty-foot inflated marijuana joint. But the storm growled and I escaped into the subway. On the train, I spoke to two young women who, like me, were escaping the nearly 100-degree heat before the storm. Both had “Bernie or Bust” signs. I am thinking about voting Green. i just can’t go back to the status quo. i know i’m an “idealist” and my vote “won’t count.” But then… to me it will. and the more and more of us who refuse to settle for the worse of two EVILS, maybe we can hope again one day. Your vote will count … for TRUMP! Unfortunately, that’s the way the antiquated US voting system works. A vote for a third party candidate who has no chance to win is a vote for the one that represents the opposite of your views. Another voting system like Approval Voting would let you vote for Jill Stein AND Hillary without contributing to the benefit of TRUMP. Ok, by that logic all Republicans voting Libertarian this year, as Ted Cruz inferred they should do in his RNC speech, are actually helping Clinton. And the Libertarians are on the ballot in all 50 states, unlike the Greens. So vote Green, especially here in Calif which isn’t even a swing state. Democracy gets messy when it’s denied.